Alessandra Crowe is the creator of The Crowe’s and its recipes. She was born in Brazil and has been living in UK for the last 18years. The Crowe’s is a family business run by Alessandra and her husband Michael and their two sons, who get involved in quite a few things too. The Crowe’s was born in a small kitchen in London, when a friend gave them a bag full of different types of chillies from his back garden; with so much chilli in the fridge, Alessandra thought to create a chilli sauce that would add taste to their food not just the heat. 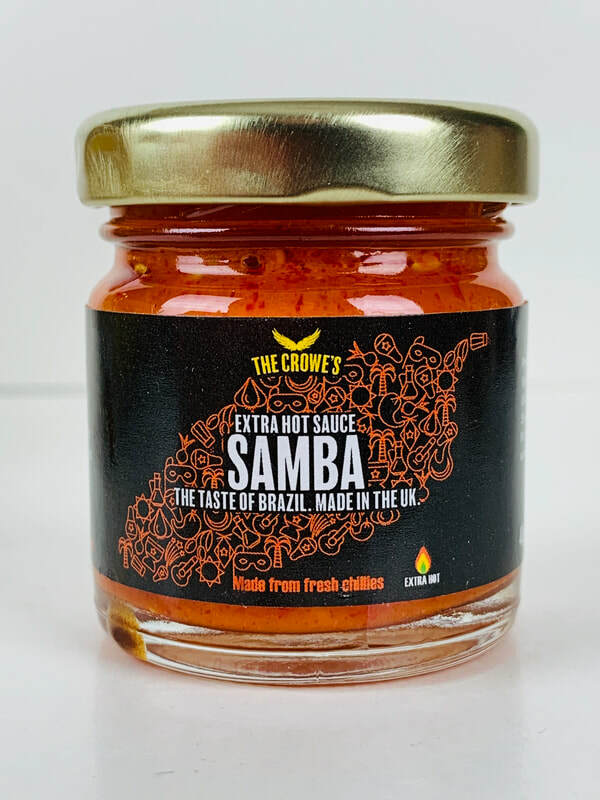 As a Brazilian, she used to have everything fresh back home, so Alessandra came up with her first recipe “Samba Extra Hot”, inspired by he home town cuisine, made with fresh ingredients, heat and lots of flavours. At this time, she was just adding some taste to her own and family dishes. Then at the last World Cup, through a conversation at the local hairdresser she made a bet; if Brazil would win the World Cup she would cook a Brazilian dish for all of them (6 guys were working there at the time), but if Brazil would lose, she would bring just her chilli sauce as consolation. Well, Brazil lost the World Cup and Alessandra won a business! Alessandra's sauce was a success. They ask her to make jars to sell to them and to their clients. Than in a few months she was also selling to friends at work, her husband’s work and at their children’s school. 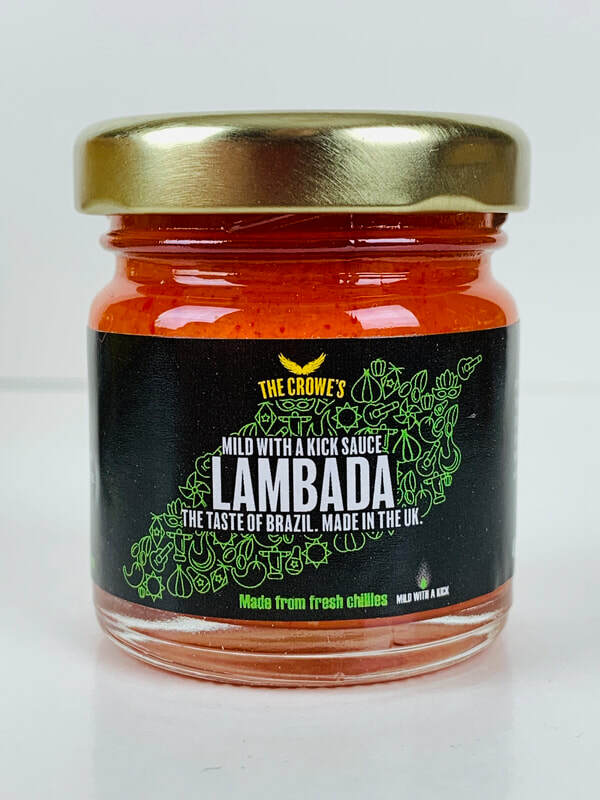 Then their 9 years old son, thought that we needed to create a mild version of it, that’s when “Lambada Mild with a kick” was born, through their son’s idea and determination of getting the great balance between flavour, heat and keep the freshness. 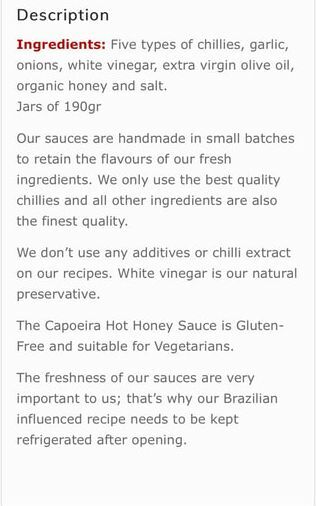 Now are based in Nottingham, selling at our local market, some Artisan Food Festivals and enjoying coming up with new recipes, such as “Capoeira Hot Honey”. 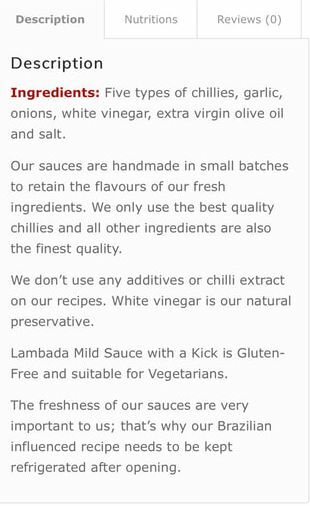 I have to say, These are some of the best and well crafted sauces I have had. I truly love the flavor of all four. Each one has a different heat level, so there is definitely a sauce for everyone. CAPOEIRA from THE CROWE'S.. Totally amazing, I could not stop eating this chilli sauce. From a chicken sandwich to potatoes, everything I added this sauce to enhanced the flavor of my food without totally burning my taste buds. But there was still enough heat to satisfy my spicy addiction. The use of five different chillies are added to fresh onions, garlic, olive oil, white vinegar, honey and salt. The melody of flavors are blended perfectly to bring you a slightly sweet chille sauce that I'm sure your going to love. 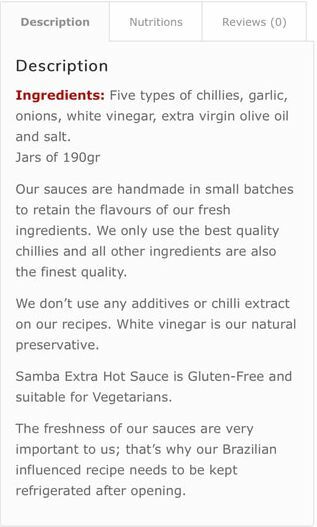 Mix this sauce into BBQ Sauce, ranch dressing, mayo or beans and rice, I'm sure you will find hundreds of uses for this great tasting chilli sauce. SAMBA from THE CROWE'S.. I find this sauce to have the same amazing flavor as CAPOEIRA, BUT! with more heat! I CAN NOT STOP EATING THIS SAUCE! All I can say is "get this sauce!" 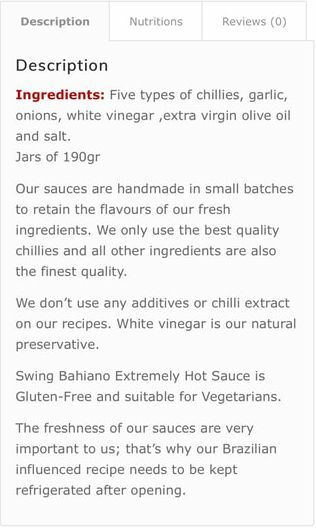 I will defiantly use this sauce for marinading chicken or pork to make same amazing BBQ. 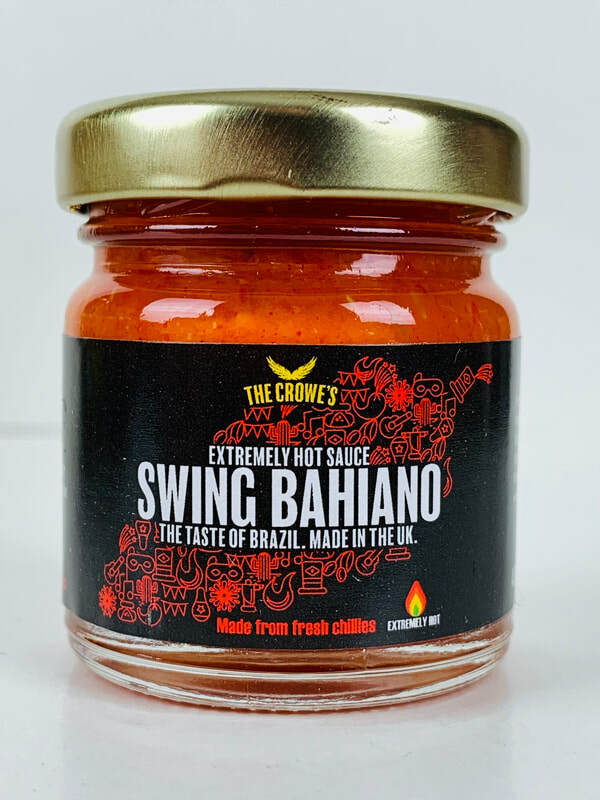 SWING BAHIANO from THE CROWE'S.. Now if you want even more heat this is the sauce for you. My lips are a tingle as I devour the entire jar just on tortilla chips. 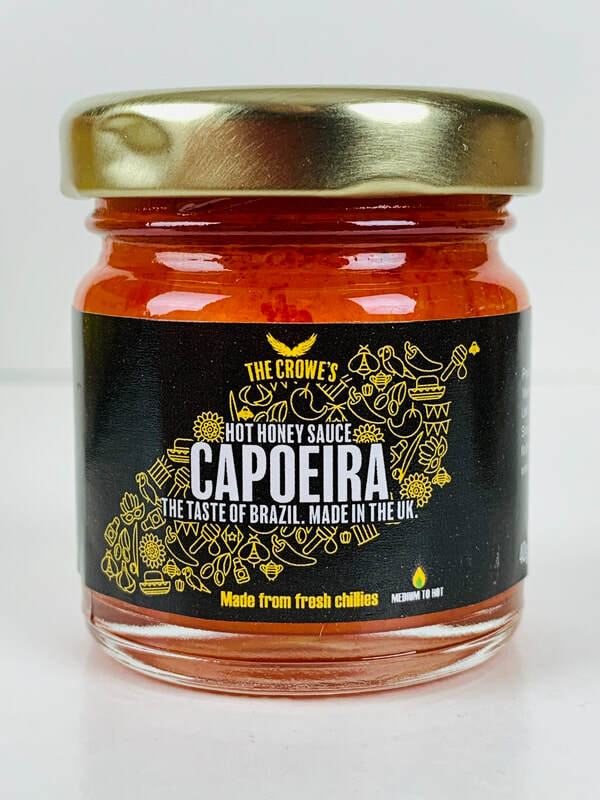 The only difference in flavor from CAPOEIRA and SAMBA is a slight difference of sweetness because of the use of more hot peppers, but with that being said, I love this sauce just as much. Hot wings are all I can think of as I eat this sauce. Brilliant! You really need to get these sauces.